You are here: Home / General Information / Animals Today March 17, 2018. Puppy dies in overhead bin of United flight. Remembering Snickers, who perished after a 2011 Delta flight. Appreciating snakes. More animals in song titles. What’s wrong with plastic straws? We begin with Peter and former Los Angles Animal Cruelty Prosecutor, Bob Ferber, talking about the recent death of a small dog who perished after forced into the overhead bin of a United airplane. Bob cautions that we need to wait for more facts to come out, but it looks pretty bad for the involved flight attendant and the airline. Ferber feels there may be both civil and criminal liability. Continuing on the same theme, Lori then introduces her 2011 radio interview with Heather Lombardi, whose hairless cat, Snickers, died after being left on the tarmac in very cold weather. Listening still breaks your heart. Lori’s subsequent email exchange with Delta offered little satisfaction. Snake advocate and Conservationist Matt Ellerbeck then returns to discuss a variety of topics about snakes, including their role in ecosystems, the difficult problem of snakes as invasive species, such as in the everglades, snakes as pets, and his experiences educating children about snakes. Visit Matt’s fact-filled website, www.saveallsnakes.com. In the final segment, Lori continues quizzing Peter on animals in music titles. Peter does a little better this time around, so listen and test your knowledge, too. Then, Lori gives an overview and update on the burden and impact of plastic in the oceans, with a focus on plastic straws. Plastic straws may soon become endangered objects in costal cities, due to new regulations and voluntary reductions in their use. 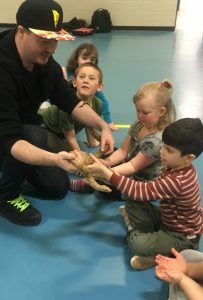 Matt Ellerbeck teaches children about snakes.